University Avenue is Frogtown’s best-known commercial street. It was once home to one of the Twin Cities’ busiest streetcar lines. 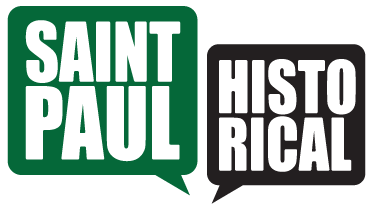 The University Avenue line connected the downtown areas of Saint Paul and Minneapolis, and also served the University of Minnesota. It also connected to several other streetcar lines including Rice Street and Dale Street. University was the premiere streetcar line in terms of ridership numbers. It served shoppers as well as commuters. METRO Green Line light rail is slated to start operations here in 2014. Just as much of Frogtown’s residential areas have been succession neighborhoods, so too have its commercial districts. That’s especially true along University Avenue. Although the south half of the avenue is in the Summit-University planning district, Frogtowners always considered University to be one of their main streets. Over the years the ethnicity of the business community changed with that of the surrounding neighborhood, with many Asian, Hispanic, and African nationalities represented today in ownership of restaurants, grocery stores, and retail and service businesses. The east end of University Avenue was recently designated as the Little Mekong District, in recognition of Asian businesses there. A look at business owner names of the past shows German, Scandinavian, Irish, Polish and Eastern European names. Many people lived and worked in the neighborhood, some living above their businesses. Well into the 20th century, Frogtown’s stretch of University Avenue was where neighborhood residents could shop for anything. Small family-run grocery stores, meat and fruit and vegetable markets provided food. General merchandise stores provided a wide variety of household goods. Confectionaries provided sweets and in some cases, a soda foundation counter. Millinery shops provided fine ladies’ hats. Cobblers made shoes for the entire family. Tailors made clothes although many families bought fabric by the bolt and made their own garments. University had tobacco shops, harness and buggy shops, liveries, livestock dealers, lawyers and more. At one time there were three movie theaters. Longtime residents recall that no one had to leave Frogtown to get anything that was needed. Many of today’s University Avenue buildings are second- and third-, even fourth-generation structures on their sites. A number of Victorian-era and early to mid-20th century commercial buildings remain. Many storefronts have been altered at the expense of their historic character, but other commercial and industrial buildings are well-preserved. While traveling University Avenue, seek out these buildings and note the unique brick and stone work, and other architectural details. Often a clue to what a building used to look like can be found on its upper floors.